"Discover The Fastest, Easiest Way To Develop A Jaw-Dropping Arsenal Of 'Go-To' Pitches... Get More Batters Out, And Win More Games For Your Team!" Truth is, the most successful pitchers at every level - from Little League to the Bigs - have a knack for disrupting the timing of the hitter. And with all the different opinions on the "right technique" for throwing a fastball, curveball, or changeup out there (not to mention concerns over arm health and safety) it's almost impossible to figure out on your own. "Pitching Grips 101" takes all the guesswork out of teaching the fastball, changeup, breaking pitches and alternate pitches to your young pitcher. The report breaks down 12 key pitches with simple step by step instructions and detailed illustrations, showing you exactly what grip and release action to use for each one. To shorten the learning curve and make sure your players "get" this stuff immediately, every pitch is explained with "brain dead simple" coaching tips and developmental drills. The three key pitches you should always focus on FIRST with any young pitcher. WARNING: do this wrong and you'll sabotage your team's performance… and risk your athlete's arm health. How to "take 12 inches" off your fastball with one simple grip change, producing a killer change-up that will totally destroy a hitter's confidence and timing! How to throw a nasty, knee-buckling breaking ball that moves late, hard, down and across.... right under the hitter's bat. A simple grip tweak that produces a "2-planed" break on your pitcher's fastball… making it practically unhittable! How to "program" your pitcher's muscle memory for an outrageously effective fastball, curveball or changeup... with a cool 7-second "Sharpie marker" trick. A 2-step "uphill pitching" routine that trains your pitchers to stay tall, get the elbow up and forward, and AVOID the loopy "sitting duck" breaking ball that's so easy to hit! A little known (yet wildly effective) "double ball" drill that automatically develops better curveball mechanics. Sure, I've been working with pitchers and "coaching coaches" for a long time - but I still consulted EVERY pitching expert I knew, personally tried and tested dozens of different techniques with my own players, and then added my own personal experiences to develop this system. I've pulled together in one simple collection the most essential techniques you need to help your pitchers build a killer arsenal, and dominate batters from the mound. The confidence you'll feel, walking onto the field at your next practice, armed with an arsenal of proven pitching techniques your players will love. Guarantee #1 - If for any reason, you think this report isn't the best $7 you've ever spent, just send me an email within 60 days of purchase and I'll gladly refund you the whole 7 dollars. And, to make sure you really hit the ground running, I'm also going to give you this free bonus report worth $10.00 on it's own! 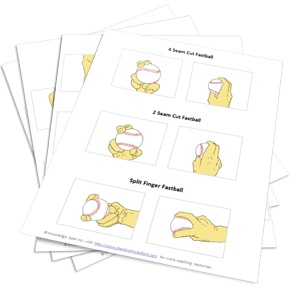 Each one uses professionally designed illustrations to show you exactly how to grip the key Fastballs, Changeups, Breaking Balls, and Alternate Pitches you'll learn! Or you can hand them out to your pitchers (or their parents) for baseball "homework" they can practice at home! YES, I want in! I want access to your "Pitching Grips 101" report, plus the bonus cheat sheets. Please give me INSTANT access to this step by step training system right now! 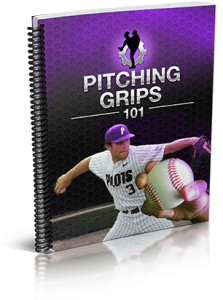 Click here to get instant access to Pitching Grips 101 now for just $7!